In honor of the Chevy Chase Library's 40th Anniversary, the Chevy Chase Friends of the Library present an opportunity quilt entitled "Bountiful Bookshelf." 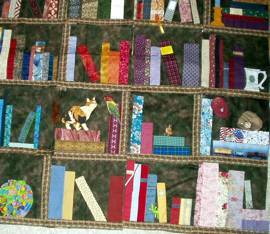 The quilt, created and donated by the Chesapeake & Potomac Applique Guild, measures approximately 56" x 72" and features bookshelves overflowing with books, pets, and other whimsies in a rich array of colors. This quilt is a one-of-a-kind creation perfect for a booklover of any age to curl up with in a window seat or display in a home library. Tickets are $1.00 for one chance, $5.00 for six chances, and $20.00 for 25 chances. They are available by mail and at select library events, including Family Fun Day on September 17 and the Celebrity Read-a-thon on October 22. The quilt will be displayed at the library from early September through October. All proceeds will be donated to the Chevy Chase Friends of the Library, which raises funds for and advocates for the Chevy Chase Library. The library opened its doors to the community in 1965. To order, send a check made out to "Chevy Chase Friends of the Library" along with a self-addressed, stamped envelope to: Opportunity Quilt, Chevy Chase Library, 8005 Connecticut Avenue, Chevy Chase, MD 20815. Please write "Opportunity Quilt" and include your phone number on the check so the Friends can call you if you win. The raffle tickets are double-sided. One half will be mailed back to you and the other put into the raffle. There will be a log of all names/ticket numbers. The raffle will start in August. All mailed entries must be postmarked by October 14. 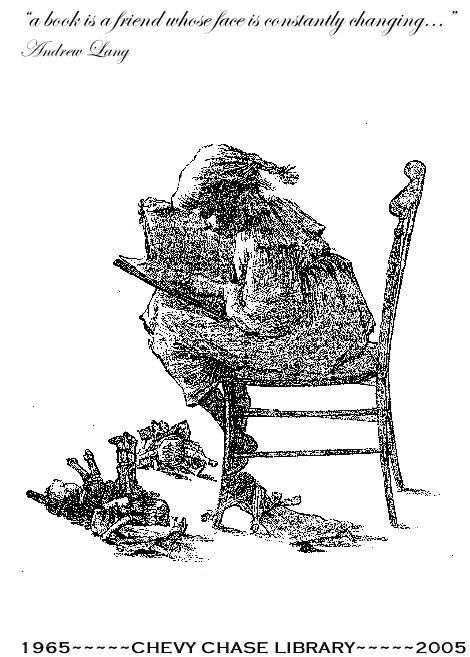 The drawing will be held on Saturday, October 22, 2005 at the Celebrity Read-a-thon being held by the Friends. The winner will be notified by phone or e-mail. For more information on the Bountiful Bookshelf Quilt or the Celebrity Read-a-thon, visit www.librariesfriend.com. Best of luck to one and all! Please feel free to cross-post and share with all your friends and family!